New blog post request: Katherine Westhoff would like to know how the kids are feeling about this whole trip. Honestly, they are doing great. The boys are happy and know the expectations and spend their days playing with many new friends. They are exhausted and dirty by the end of the day but are adjusting very well. Elena now is figuring out her place here as well, and is relaxing into our routine. Basically though, our kids are the same. Elena is still FULL of life and fun but still melts down periodically when she needs to share attention. Guy still forgets important things like shoes but remembers more important things like kindness. Joey still is following very carefully any direction and works hard and plays hard. Kids are kids. And what better why to give you a glimpse into their thoughts than through their journals? Here are some pics of a few of Joey and Guy's journals! Captions below each. 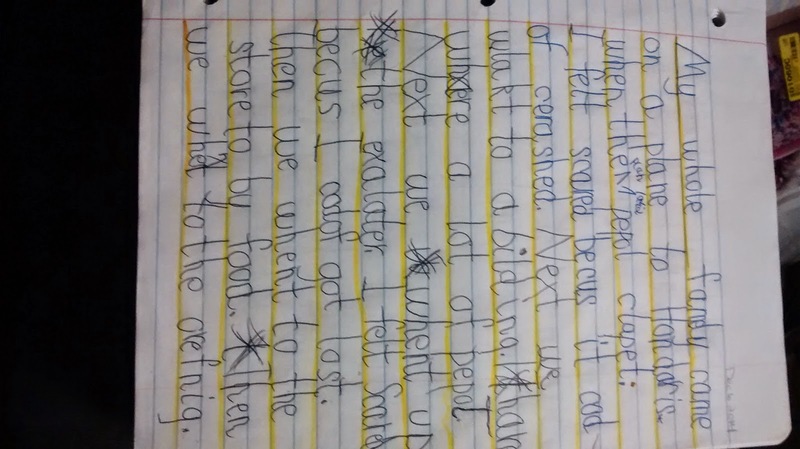 Joey: December 6: "My whole family came on a plane to Honduras When the plane landed people clapped. I felt scared because it could have crashed. Next we walked to a building. There were a lot of people. Next we went up the escalator .I felt scared because I could of got lost. Then we went to the store to buy food. Then we went went to the orphanage." 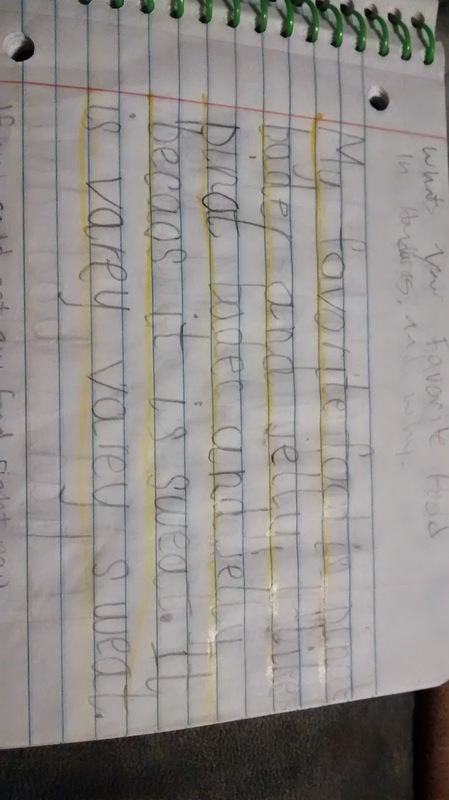 Joey: Q: What is your favorite food in Honduras and why? A: "My favorite food is peanut butter and jelly. I like peanut butter and jelly because it is sweat (sweet). It is very very sweet." Joey December 24: "I am excited for Christmas because we get to open presents and celebrate new life." Joey: Question: What did you do today that was fun? (Joey edited it so it said 'NOT fun' then answered) A: I had a bad day because at the park the little girls were playing tag and three girls tagged me. 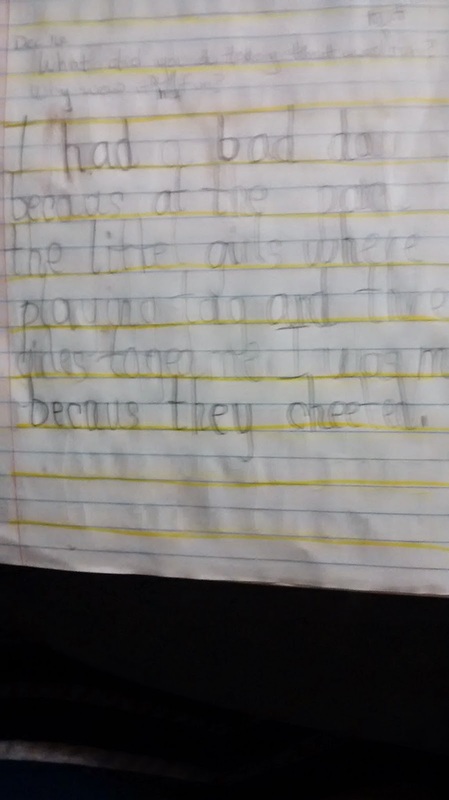 I was mad because they cheated." Joey: "The best part of my day was when I found two necklaces. One was red and one was white. 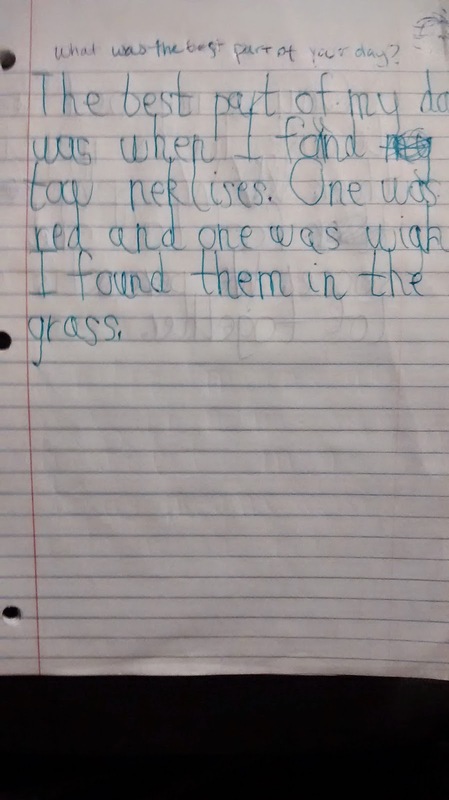 I found them in the grass." Guy:Q: What happened today? A: "Kensie gave me a picture." Guy: Q: What was the best part of your day? 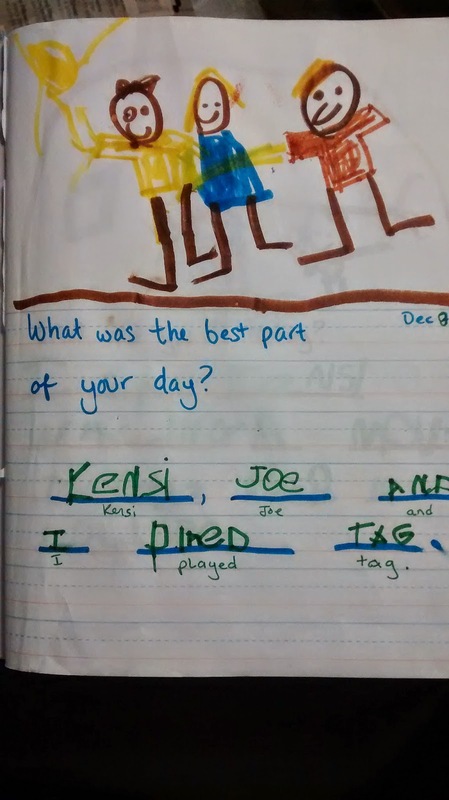 A: "Kensie, Joe and I played tag." Guy: Q:What did you do today? 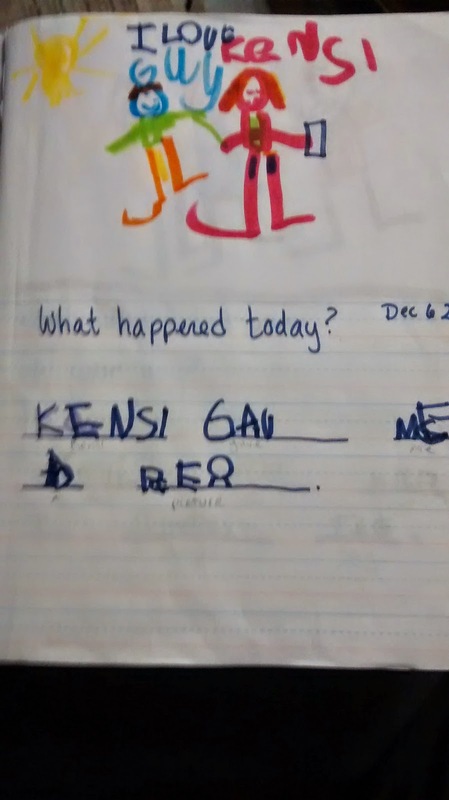 A: "I saw Kensie watching a movie. 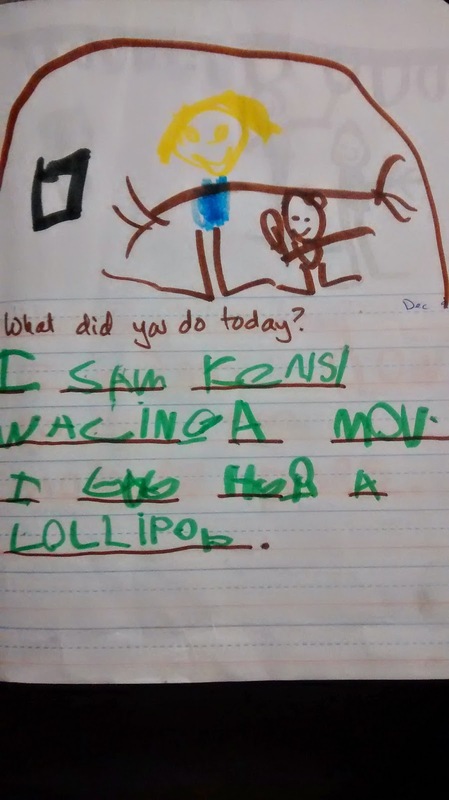 I gave her a lollipop"
Guy: Q: What did you learn today? 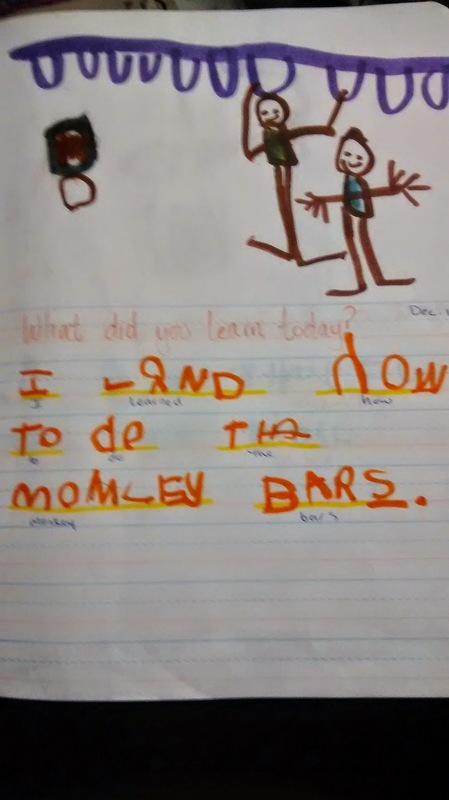 A "I learned how to do the monkey bars." Guy: Q: Who is your best friend? 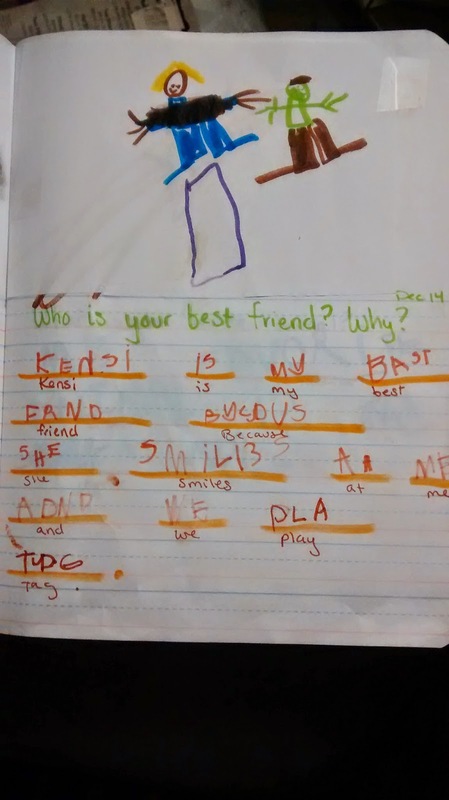 A "Kensie is my best friend because she smiles at me and we play tag." Side note: at least 12 entries are about this girl Kenzie. To broaden his entries I finally had to make a rule to try that Guy had to write about something else. Guy: Q: What did you see on our walk today? 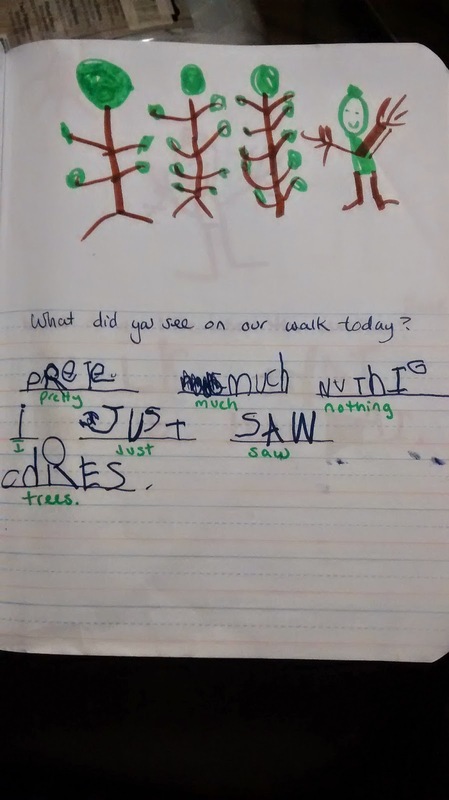 A: "Pretty much nothing I just saw trees." Guy: Q: What did you do today? 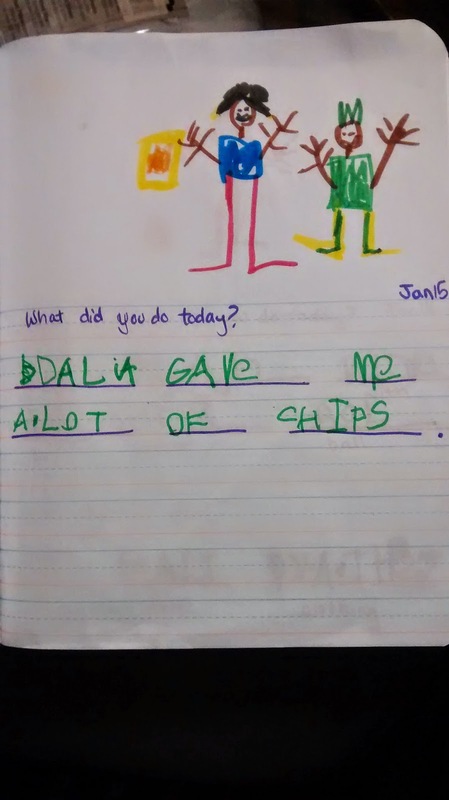 A: "Dalia gave me a lot of chips." 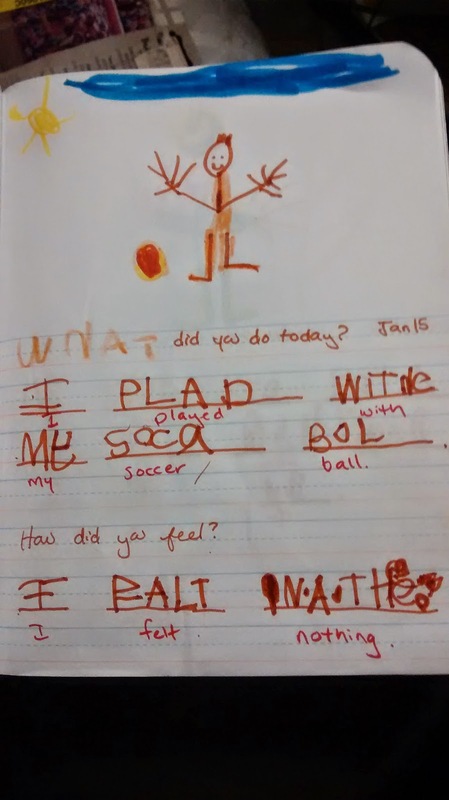 Guy: Q: What did you do today?A: "I played with my soccer ball." Q: How did you feel? A: "I felt nothing." 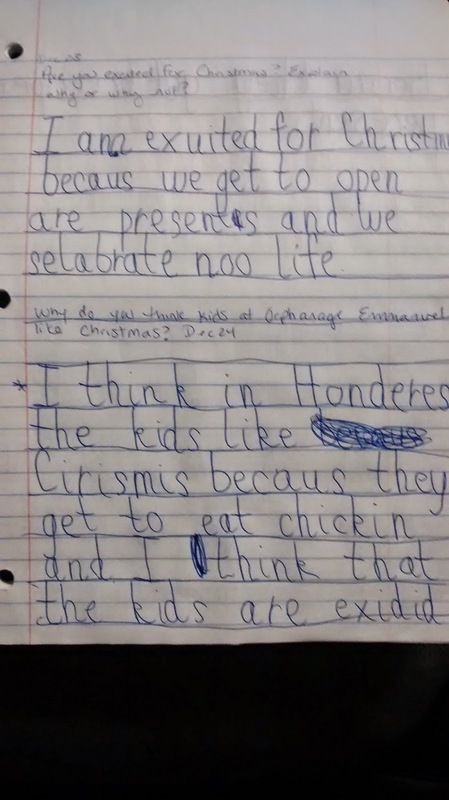 Guy: Q: What do we celebrate on Christmas? 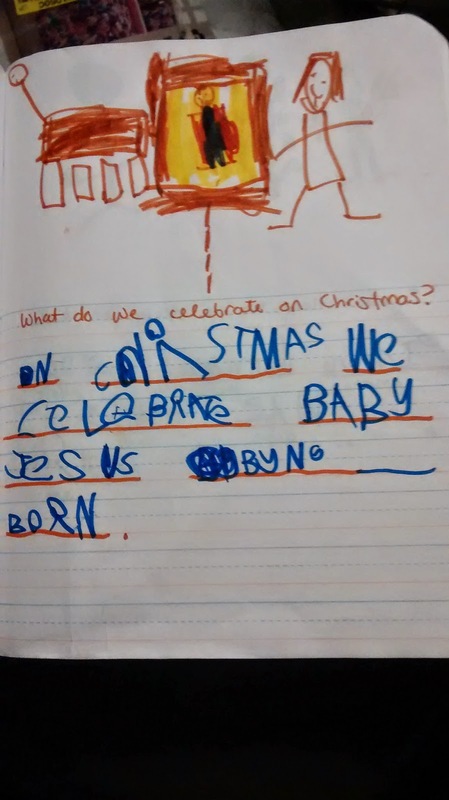 A: "On Christmas we celebrate baby Jesus being born." Well folks, there you have it. I want them to think 'big picture' about this trip and life, and instead I have journals about swings and football and trees and friends. It is perfect. I'll save them forever.